Scene setting: The luxury industry today is driven by revenue and profit margins, conglomerate competition and the race to produce the season’s ‘it’ design (be it a logo emblazoned T-shirt or entry-level trainer). It’s refreshing that fashion label Symonds Permain, founded by conceptual designer Anthony Symonds and super stylist Max Pearmain is anti mass-market and high fashion homogeneity. Since launching in 2016, the brand has sold its designs like art pieces, through Bortolozzi in Berlin and Cabinet Gallery in London. Six months ago, it launched e-commerce with limited runs of product. For spring, Symonds Permain has launched an exclusive collection with Matchesfashion.com, and in celebration of the release, showcased its A/W 2019 collection in an intimate salon show, on the ground floor of the retailer’s Mayfair townhouse, 5 Carlos Place. Mood board: There was a strong dose of irony in Symonds Permains’ show notes. They contained an excerpt from Volume 1 of Georges Batallie’s The Accursed Share, a 1940s economics essay positing that part of the human economy is going to be wasted on luxurious items. 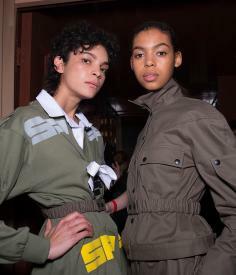 Models, including brand regular Lily McMenamy pranced down the catwalk, in a colour palette of khaki, camel and brown. They cavorted in equestrian jodphurs and quaint dog-cartoon pantaloons, bow detail rugby shirts, leather motorcross jackets with in-built neckerchiefs, and doodled William Morris print trousers. Theatrical and fancy, and importantly for fashion week, fun.